If necessity is the mother invention then there is at least one really positive development that has arisen from a universal shortage of natural resources: artists and designers around the world have found all kinds of creative ways to give discarded and existing materials new life. 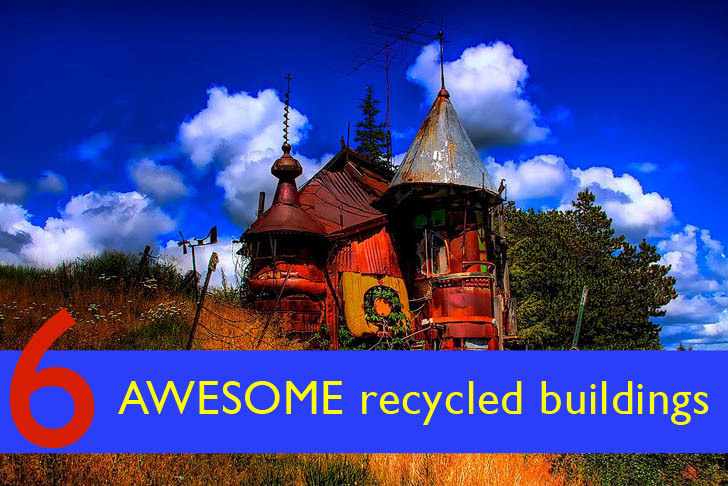 To demonstrate just how many new ways there are to build a structure, we have put together a list of 6 really awesome buildings from Seattle to Seoul that are made from recycled materials. We hope you are as inspired as we are by this showcase of adaptive re-use projects that convert everything from tires to window frames and doors into functional buildings. This incredible “junk castle” designed by Victor Moore is made entirely out of scrap materials, and here’s the best part. The whole thing only cost $500. 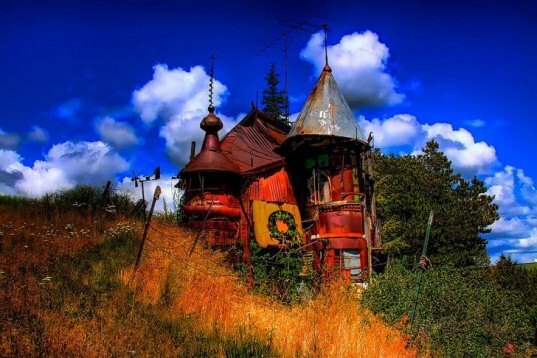 Now we realize that not everyone is interested to live in a house that was put together with materials salvaged from the nearby junk yard, but this is a clear indicator of what can be done with a bit of ingenuity and out-of-the-box thinking. Moore’s MFA assemblage thesis was constructed in 1970! When a major corporation like Starbucks creates a new branch out of 4 recycled shipping containers, it starts to seem like the rest of the world might finally catch on to the numerous benefits of recycling existing materials. This awesome reclamation drive-thru in Tukwila, Washington may be part of the company’s new branding strategy, which includes an emphasis on reducing energy and material use. And just when this new Starbucks seemed like it couldn’t be any cooler, we found out that it was designed to meet LEED certification. This charming building in Sweden is made from cinder blocks and 36 reclaimed window frames, and we think it’s absolutely lovely. The waterfront cottage designed by Karin Matz is minimally-funished and flooded with daylight, and makes a wonderful guest house for anyone interested in a rustic getaway! When we first saw this ten-storey building in Seoul wrapped in recycled doors, we did a double take. But as soon as we realized that the South Korean artist Choi Jeong-Hwa was behind the project, it made total sense. Jeong-Hwa wanted to transform a rather bland facade into a colorful, pixelated structure that relied only on existing materials, and this is what he came up with. It’s funky but genius. When was the last time you saw a building made out of giant Texaco signs, ironing boards, and window screens? Well, it’s quite possible that you never have, but you should. This funky little structure was the result of a 10 week design workshop in North Carolina and has become a learning pavilion for the Burton Street Community Peace Garden. Not only was it made of salvaged materials found on site, but it also incorporates passive solar design and harvests rainwater. And it’s adorable to boot. 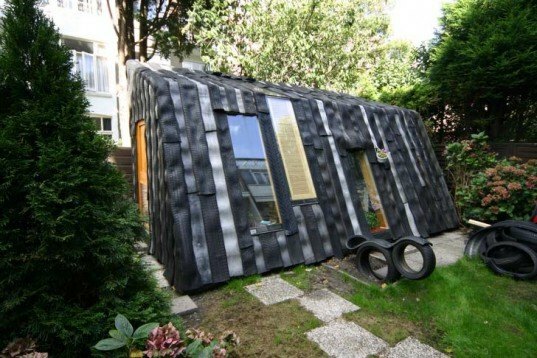 Our final project is the funky Maisongomme garden office which is made of locally-sourced scrap materials and clad in a layer of discarded rubber tires! 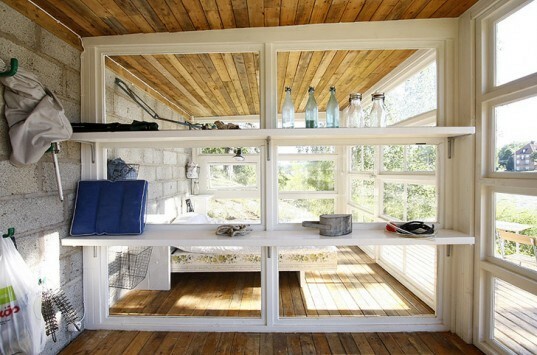 This wonderful little space by Refunc doubles as an office and storage shed for a couple keen to maintain a small environmental footprint. Ms. Laylin- Please consider expanding this story into a series so that the "so many awesome projects" can keep inspiring us! Thanks Atom Farm. There are so many awesome projects that we could have covered, but we only had space for six! Great article, but you completely left out Earthship! I interned there, and we would literally use trash as insulation, bottles and cans in walls, car windshields for windows, sheet metal to fabricate wind turbines, and car tires as the foundation. Not to mention they are completely off the grid and support life with a greenhouse and thermally charged walls set in the earth. This incredible "junk castle" designed by Victor Moore is made entirely out of scrap materials, and here's the best part. The whole thing only cost $500. 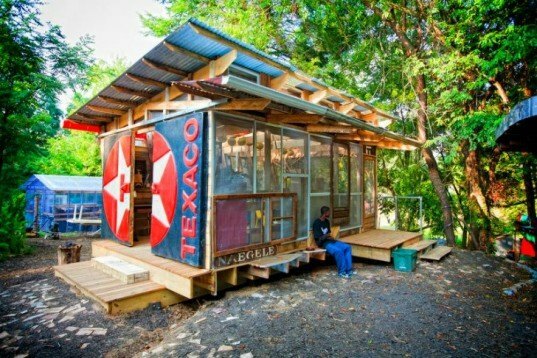 Now we realize that not everyone is interested to live in a house that was put together with materials salvaged from the nearby junk yard, but this is a clear indicator of what can be done with a bit of ingenuity and out-of-the-box thinking. Moore's MFA assemblage thesis was constructed in 1970! 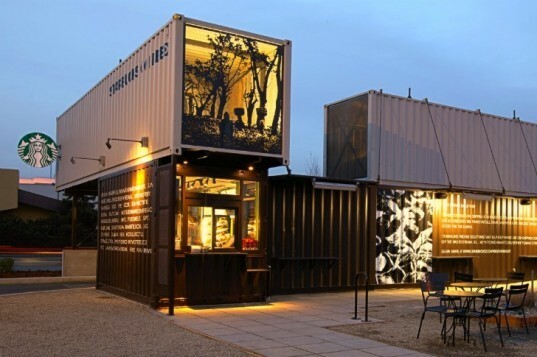 When a major corporation like Starbucks creates a new branch out of 4 recycled shipping containers, it starts to seem like the rest of the world might finally catch on to the numerous benefits of recycling existing materials. This awesome reclamation drive-thru in Tukwila, Washington may be part of the company's new branding strategy, which includes an emphasis on reducing energy and material use. And just when this new Starbucks seemed like it couldn't be any cooler, we found out that it was designed to meet LEED certification. This charming building in Sweden is made from cinder blocks and 36 reclaimed window frames, and we think it's absolutely lovely. The waterfront cottage designed by Karin Matz is minimally-funished and flooded with daylight, and makes a wonderful guest house for anyone interested in a rustic getaway! 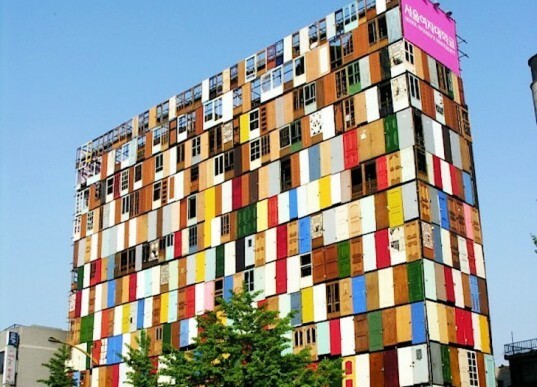 When we first saw this ten-storey building in Seoul wrapped in recycled doors, we did a double take. But as soon as we realized that the South Korean artist Choi Jeong-Hwa was behind the project, it made total sense. Jeong-Hwa wanted to transform a rather bland facade into a colorful, pixelated structure that relied only on existing materials, and this is what he came up with. It's funky but genius. When was the last time you saw a building made out of giant Texaco signs, ironing boards, and window screens? Well, it's quite possible that you never have, but you should. This funky little structure was the result of a 10 week design workshop in North Carolina and has become a learning pavilion for the Burton Street Community Peace Garden. Not only was it made of salvaged materials found on site, but it also incorporates passive solar design and harvests rainwater. And it's adorable to boot.